It isn’t any secret that social media can be a powerful for growing a business and connecting with prospects. The big secret has been outlining a way to make this dream a reality. Business owners and CEOs have been left to wonder if the money they are spending on social media marketing will ever generate a return on investment. Sales people have been stuck wading through a crowded stream of irrelevant conversations, left to look for gold in a pile of mud. 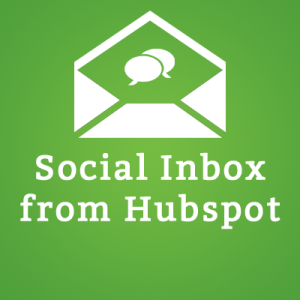 The smart folks at HubSpot have heard these pains and have come up with an amazing new social media tool called the Social Inbox. This tool will help business owners understand which new customers have came through social media channels and the tool will help sales to organize and prioritize their social conversations. The problems with social media monitoring all stem from having to sift through a fire-hose of strangers. Without any context, you have no idea who to prioritize and how to address them. This wastes time and results in impersonal, disconnected interactions that don’t do much for your business. Imagine if finding important social media conversations are easy as an email inbox. 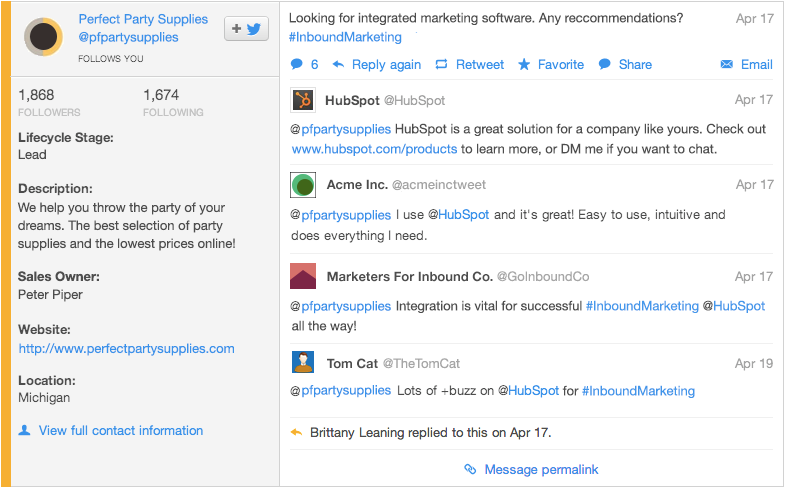 HubSpot turns down the firehose by plugging social media into a powerful contact database, enabling you to create highly targeted segments of leads and customers. This integration lets you to alert a sales rep when a high-scoring lead mentions a competitor or to turn a one-time social interaction with a customer into a series of follow up emails. With HubSpot, Social Media shakes off its silo and becomes a contextualized part of your marketing, sales, and customer service strategies. It’s this same system that also enables you to measure the true ROI of your social media efforts. By integrating social data into your full marketing analytics, HubSpot shows you how many leads and customers were generated by social and tells you who they are. Why create a “Social Inbox”? Amid all of the noise on social media, some messages are just more important than others. Creating an inbox, complete with filtering and priority alerts, enables users to elevate messages from their most important contacts – their customers, leads, or influencers. Social inbox marries the best parts of your social and email channels. Like email marketing, you can use Social Inbox to create highly targeted segments, for example, social contacts in a particular role or at a certain purchase decision point. But, because of internal alerts and CRM integration, responses are kept personal, not automated. When someone does respond, from a marketing manager, to a sales rep to a customer service professional, they’ll have the context they need from the contact’s profile to do so in a relevant and tailored way. Bottom line: Social Inbox makes scaleable personal attention possible. What features does this add to HubSpot Social Media? Better monitoring of keywords and twitter lists. New: Monitor your smart lists. For example, you can get a view of just your qualified leads on twitter. 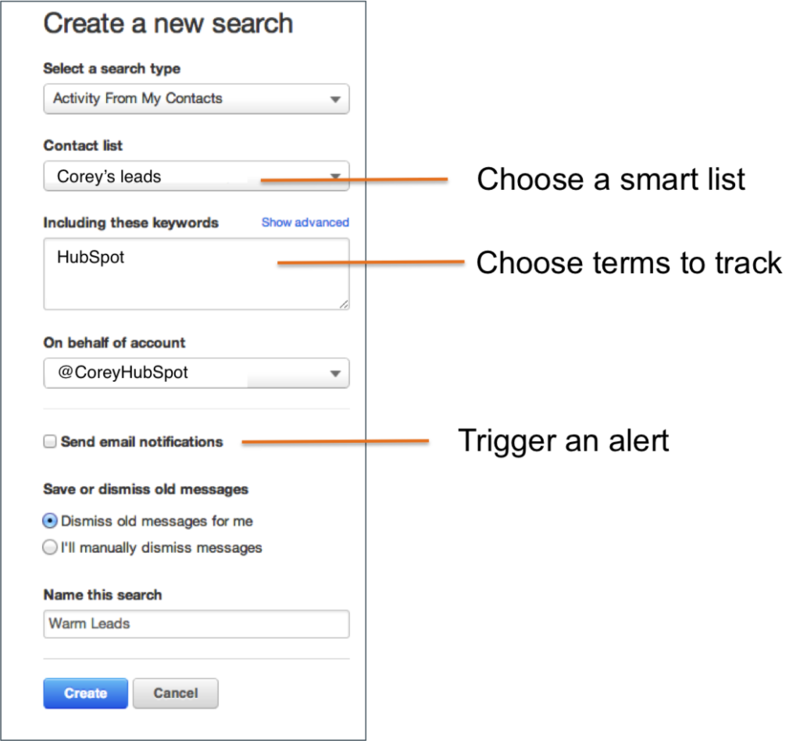 New: Get email alerts for when a lead, customer or other targeted contact mentions a certain keyword or a competitor. 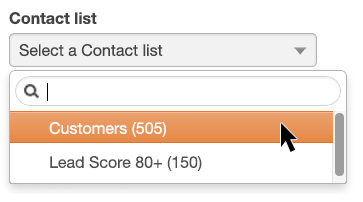 New: “Contact match” search to help you find the twitter handles of more contacts. New: Assign or forward a tweet for response. And see a history of responses. New: See lifecycle stage and salesforce owner of each social contact, then click through to see the full profile. Here is a sneak peak into the tool! Listen to what your marketing database contacts are saying on social media. Track the conversations with your prospects and leads. Use color codes to organize your stream based on life cycle stages.